You have to be living under a rock to now have heard of blogging. Every one is doing it, or at least trying. Most every one knows blogging can be profitable, but many don't know how to get started or how to make it a success. Here is where you come in, by showing people how to start blogging, how to blog, getting traffic and ranked in the search engines and more. As you provide them with actionable information, you have the opportunity to suggest or point them to products and services that earn you commissions. You'll be getting everything you need to not only build a large profitable mailing list in this popular niche, but you'll have pre-written messages ready to send to your buying blogging subscribers. This package includes everything you need to build a list and mail to your list on a regular basis, which means more opportunities to sell them something. It's a complete package because, you'll get a well done, ready-to-go blogging squeeze web page and matching confirmation web page. Just insert your Opt-in form, upload the webpages and it's ready to start building a list for you, and talking to that subscribers, all on auto-pilot. We also revamped the Squeeze page and added some compelling bullet points to increase the Opt-in rate and better use of your traffic. 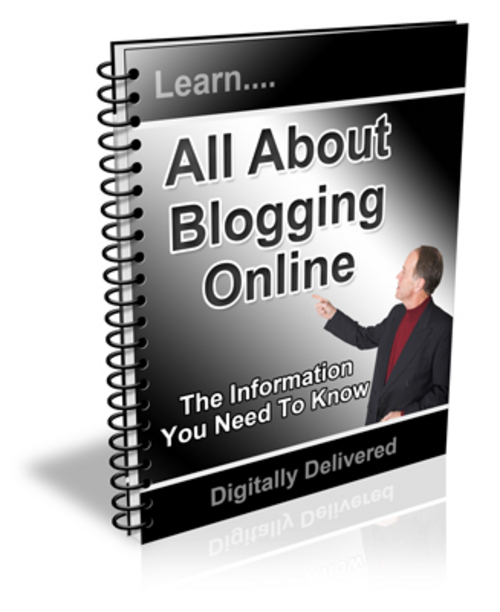 You will be getting 24 Pre-Written messages dedicated to the in's and out's of blogging. Add your money links or affiliate links, or any links you wish for that matter, copy and paste the messages into your Autoresponder series and your done. It's very simple and easy. With all the blogging affiliate products and services, you won't run out of ways to profit from a blogging list any time soon. The messages are even per-formatted to 65 characters per line to save you time, you don't need to edit the line lengths, it's already been done for you! These messages are high quality with a large amount of text and well written text at that, with over 14,000 words! Talk about some content! Messages come in both TXT and Word Doc format for easy use. Each email message comes with a closing hook at the end of each message to keep your subscribers looking forward to your next email and more likely to open your mails, which can mean a much more responsive list for you and a much better chance of making sales! This package also comes with PSD images files for the so you can brand the squeeze and confirm webpages, ebook graphics and edit them exactly how you want. You could also add your name or your website address. You become the Blogging expert and guru by branding yourself or your business, which means more trust from your readers. You could use these blogging Autoresponder message Series as a brand new AR Series or add them to a series you currently have running for extra messages and even more opportunities to profit from your growing list. You'll also be getting a complete reseller kit which includes a matching salespage and download page. Add your payment and download links, upload and it's ready to start selling for you, 24 hours a day, 7 days a week. So you have two ways to profit from this set. Use it to build a list that can make you sales far into the future, or resell the package and you keep 100 of the profits. Or do both! "Get Your Hands On 24 Ready To Go Newsletter Issues With Unrestricted Private Label Rights!" Are you sick and tired of writing and hunting down content to send to your subscribers? Then spending even more time editing that content into a newsletter issue that makes sense? Well now you don't have to worry about that any more. At least for a little while! Introducing a copy, paste and send solution that will save you hours of time and trouble! The "All About Blogging Online" newsletter package is a nice collection of private label articles all pre-formatted in a ready to go newsletter style format. All you have to do is plug in your promo ads and any other content or publisher notes that you want and send it to your subscribers. It only takes a few minute to customize all of the issues! Yes, you read right! It only takes a few minute to customize all 24 issues included in this package. You can add your name contact information and URL with just a few clicks of your mouse. Leaving you more time to focus on more important things like promotion, lead generation, list building and product creation. What makes this even better is that once you have all of the issues customized you can plug them into your autoresponder, set them to go out every week or once or twice a month and then let them do their job! Which is to keep you in the mind of your readers on a regular basis. if you grab this brand new newsletter package with unrestricted private label rights now! No-Restriction Private Label Rights: You'll Get The Newsletter Issues In Text and Word Doc Format + A Complete Graphics Package with PSD Source Files! Description: The All About Blogging Online newsletter series will provide you with quality information on Blogging Online. You will receive 24 ready to go issues that will allow you to teach your readers what it is, how it works and how they can use to effectively use it to build their own profitable blogging business on the internet. 1 Newsletter Complete Series - You get the complete newsletter collection containing 24 issues in both text and doc format (source code that you can edit) to create your own customized newsletter issues. Custom Designed Cover Graphics - the cover graphics come in several different sizes. You also get the Photoshop (PSD) source files, so that you can quickly edit the covers and add your name to them! The Private Label Rights License - this gives you the right to edit the content and the graphics, brand them as your own and use them to promote your products and affiliate programs! A Complete Resellers Package - This is an extra special bonus that will allow you to package up this newsletter set and sell it as your very own product.